Nepenthes albo-marginata (or albomarginata) is a common pitcher plant in the northern coastal regions of Peninsular Malaysia. Commonly seen around Penang Hill (as a matter of fact, on any exposed hill-slopes usually at elevations of 300m above sea level or higher on Penang Island). So common that you hardly see any other types of common lowland Nepenthes (N. ampullaria, N. gracilis and N. mirabilis) on Penang Island. One of my Nepenthes albomarginata that I had previously. This was grown from a 'plum-red' type from Penang Hill. Now where to see N. albomarginata at Penang Hill? This post is actually in response to a blogger friend, i.e. Kak Mar's post of flowers at Flagstaff Hill (Bukit Bendera) where she missed out on sighting the pitcher plants due to the lack of info. Whilst there is a place where you can see all sorts of pitcher plants up there, there is no need to pay if you are only interested in N. albomarginata. 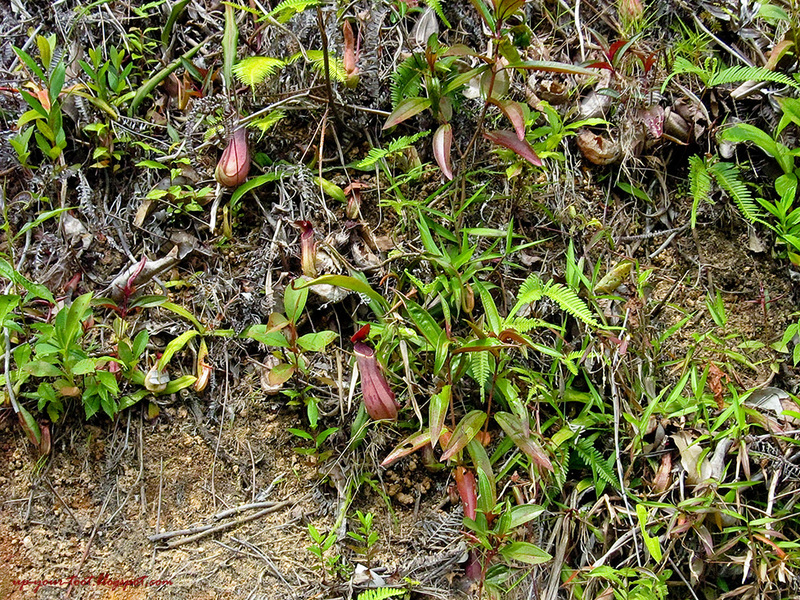 An earth bank along Summit Road, Penang Hill covered with Nepethes albomarginata and Melastoma (senduduk). 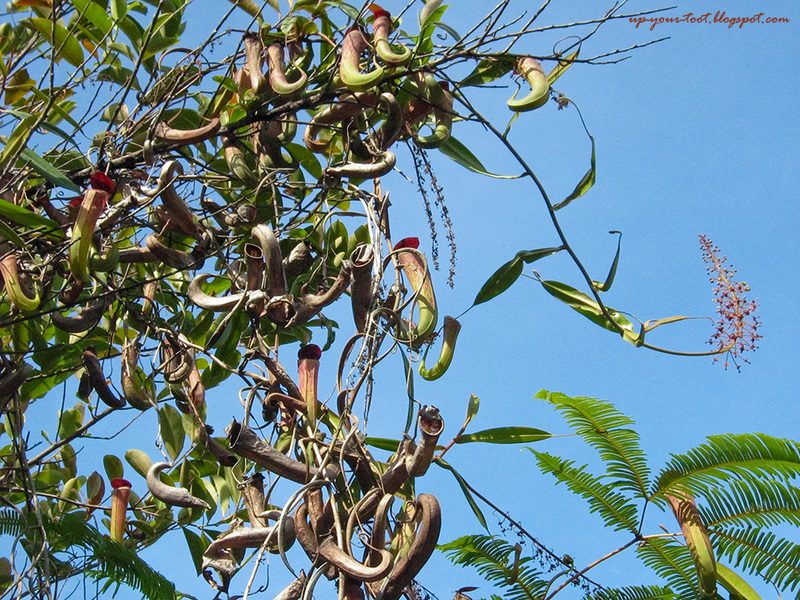 Most people fail to take a closer look and spot the Nepenthes, thinking it is just undergrowth (semak-samun). Nepenthes albomarginata are actually everywhere - along the Jeep track up to Penang Hill, along the Summit Road, on any disturbed earth bank up on Penang Hill, (including the by-paths) the road to Air Itam Dam, the circular road around Air Itam Dam, and even on the earth bank of the road behind Kek Lok Si temple leading to the Kuan Yin statue, the plant grows well and almost weed-like. Once the hill-slope had been disturbed and there is enough moisture and light, seedlings seems to appear like magic on and around the hilly areas of Penang. A group of Nepenthes albomarginata seedlings. This group are exposed to the same light condition and yet some are green and some are plum-red. This indicates that the plum-red type is probably genetic. The green ones cannot turn plum-red, but under unfavourable condition, the plum-red ones will lighten to a more greenish colour. One of the good spots to see Nepenthes albomarginata on Penang Hill (besides along Summit Road) is at the end junction where the jeep track banks to the right and the cement path from the steps by the police station ends. The earth banks, which at some spots are nearly vertical, have many plants. 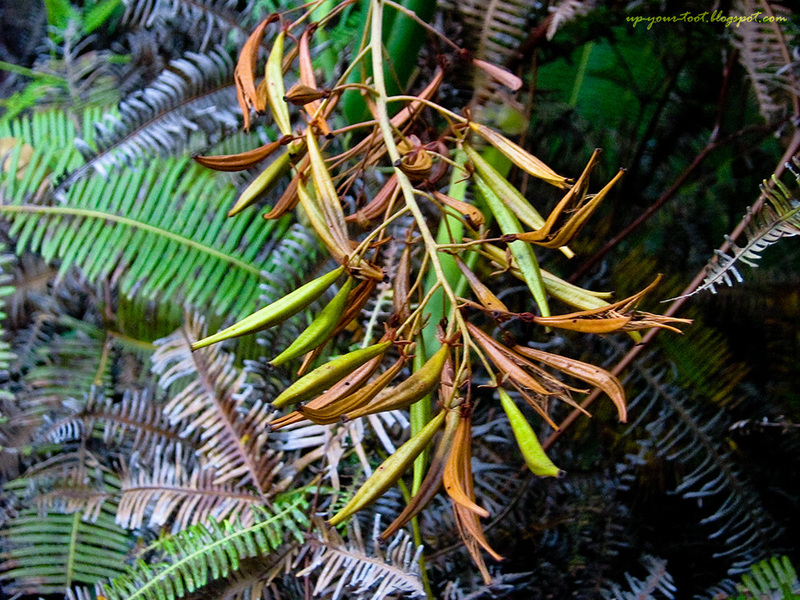 The climbing stems and dried pitchers from those also form tangled masses around the shrubs in the area. 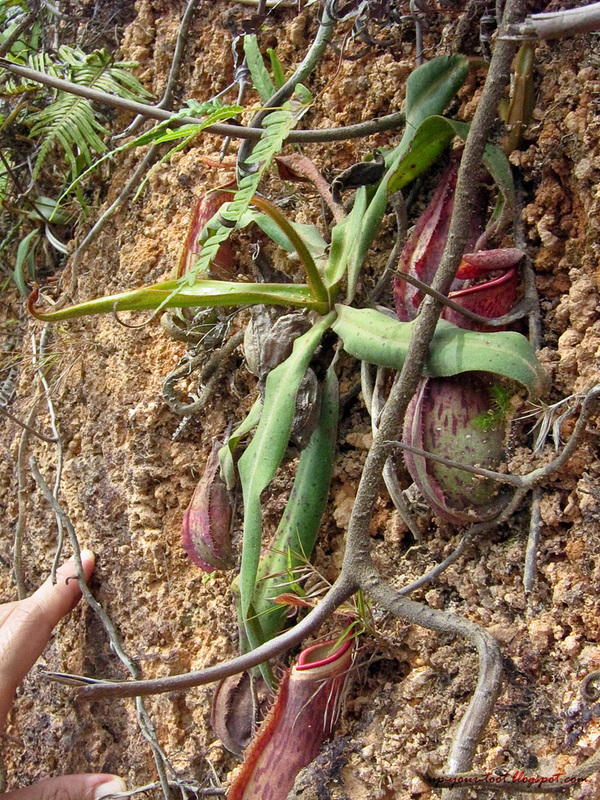 Nepenthes albomarginata plants clinging on the near-vertical earth bank at the junction of the Jeep Track with the cement path that leads to the police station at Penang Hill. Note the leaves and pitcher lids are slightly curled in, a sight of water stress. They are used to getting somewhat dried out between Dec-February. 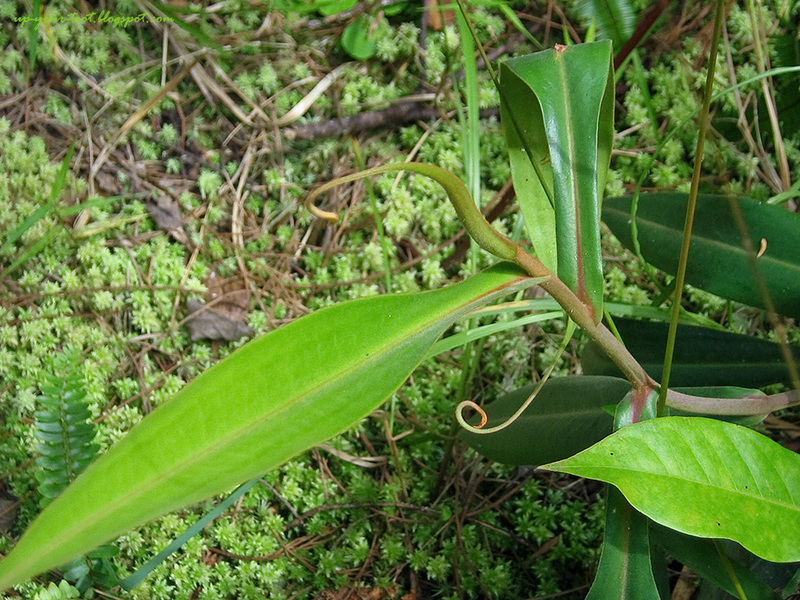 A climbing shoot of Nepenthes albomarginata. 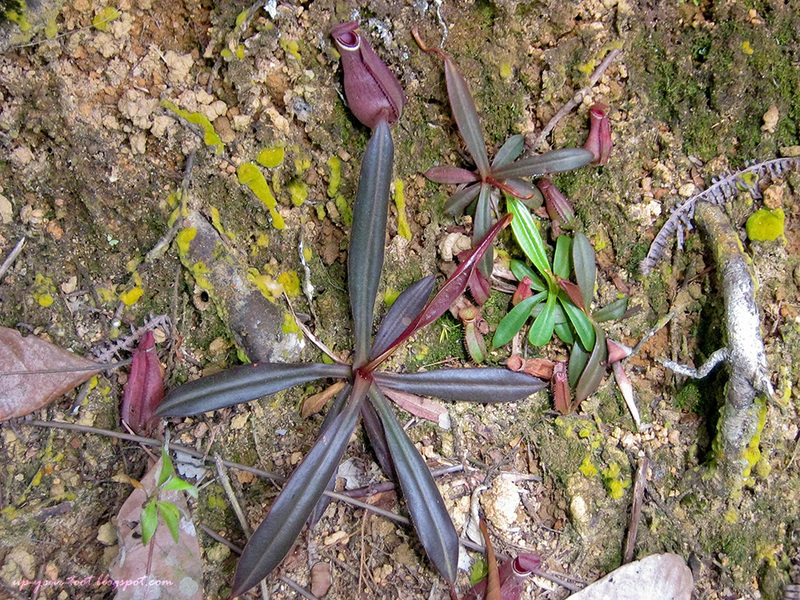 This plant is growing in the shade at a mossy bed area of one of the peaks at Penang Hill. Note the sphagnum moss on the ground. Another spot is on several locations along the trail to No. 47 from the Penang Botanic Garden. The clearing after the leveling has a lot of pitcher plants that scramble up the secondary forest shrubs. This is the spot where you can see how efficient they are as climbers. Tangled masses of dried and new upper pitchers of Nepenthes albomarginata. The flowers are male, and this entire plant clump appears to be male. This is along the trail to No. 47 from Penang Botanic Garden. 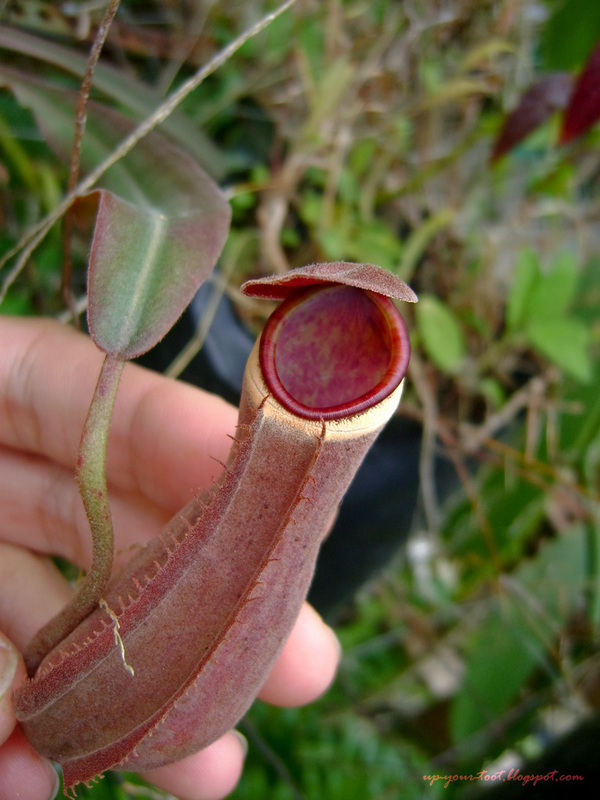 As with all Nepenthes, they produce distinct rosette (lower) and upper pitchers. 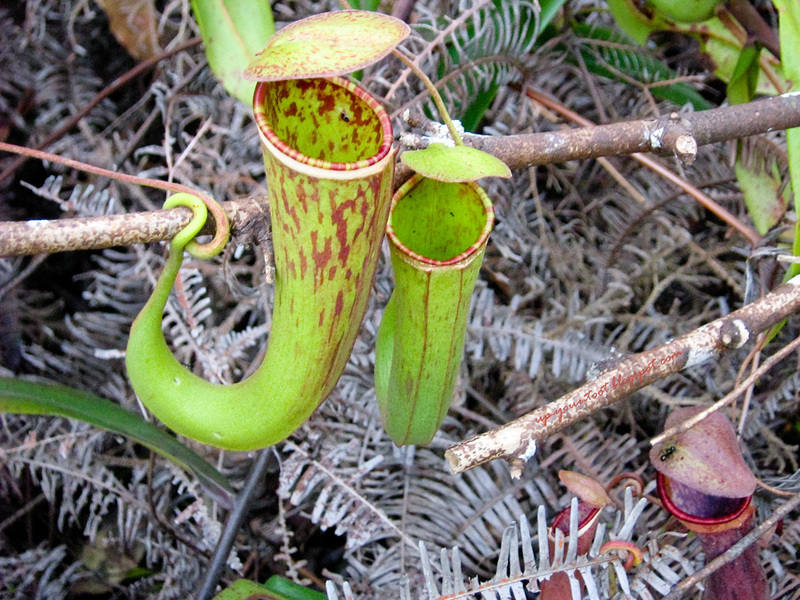 The lower ones are flask-shaped whilst the upper pitchers are funnel-shaped. The pitcher colouration of this Nepenthes is variable; from all green or green with red splotches to dark plum-red . The peristome of the pitcher (the rim of the pitcher) can be of solid colour, that is identical to the pitcher wall or banded (red and green). A pair of red-spotted upper pitchers of N. albomarginata with banded peristome. There's a pair of red lower pitchers partly hidden by the dried fern leaves on the lower right corner. Upper pitchers are cylindrical-infundibulate in shape whilst the lower pitcher have a bulbous basal third and cylindrical above. The northern region of Peninsular Malaysia is known for the 'Penang Red' variety. The entire plant is plum-red. However, I have seen some with darker plum-purple pitchers but with green leaves in both shaded and exposed locations, thus excluding sun exposure as the colour-intensifying factor. In fact there is a section of the Jeep track up Penang Hill that is dimly lit but have what appears to be a population of all red plants (entire plant plum-red). A deep red-purple lower pitcher of N. albomarginata. This is a reasonably good-sized pitcher. 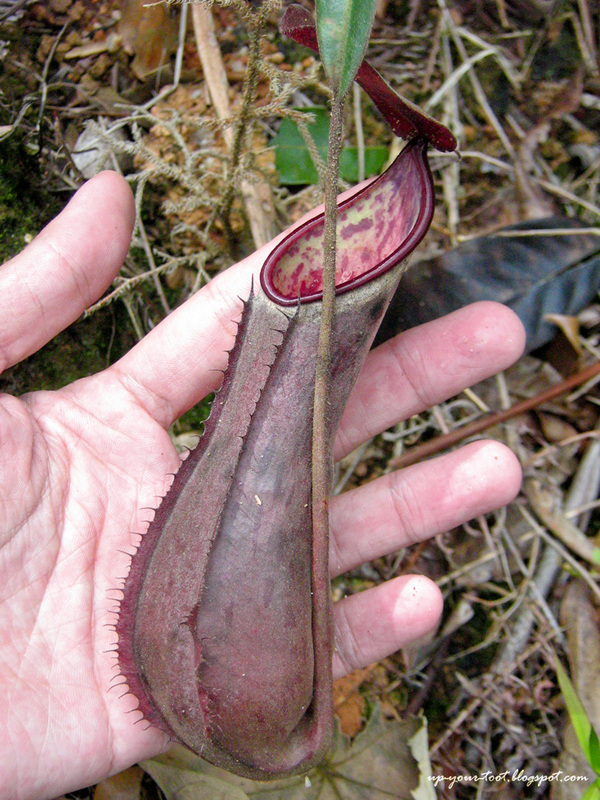 I have encountered lower pitcher that are larger, up to 25cm in length at the Tiger Hill trail. 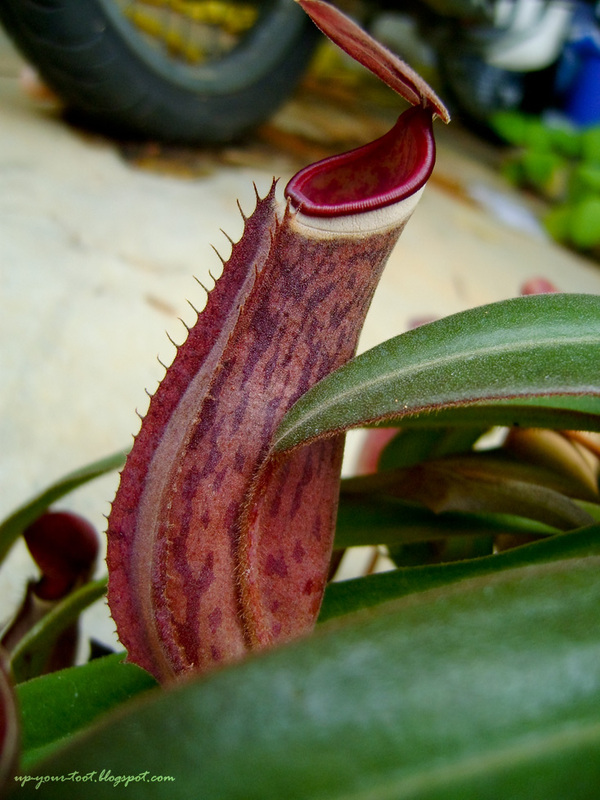 The pitchers usually do not grow longer than 15cm in length. A 'shocking plum-red' seedling of Nepenthes albomarginata. This is along Summit Road (Jalan Tuanku Yahya Petra) at Penang Hill. 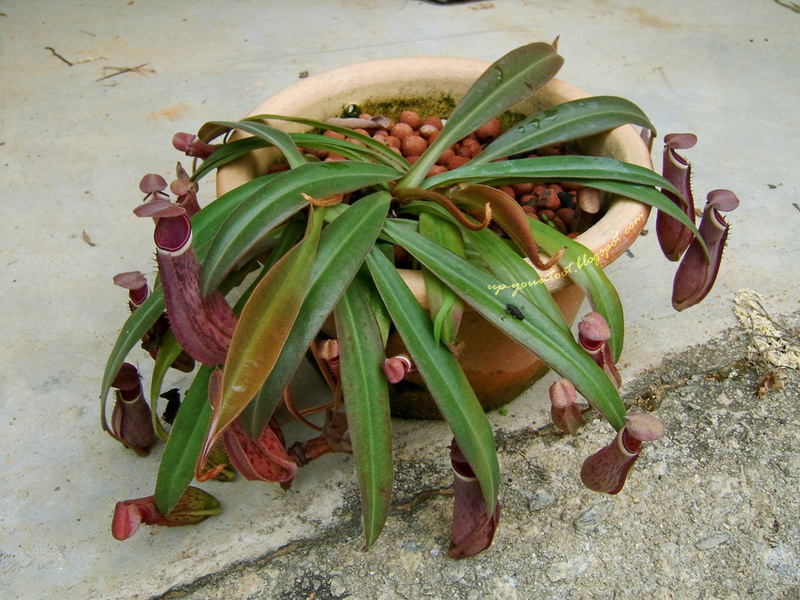 The earliest recollection of my facination with this plant was when I was a kid, and my dad came back from one of his school trip up Penang hill with the scouts; for he had brought home the pitchers of this plant. The fact of not knowing which part of the plant the strange-looking pitcher belongs to (the pitchers were severed at the petiole so as not to damage the 'leaves') only served to fuel my curiosity. 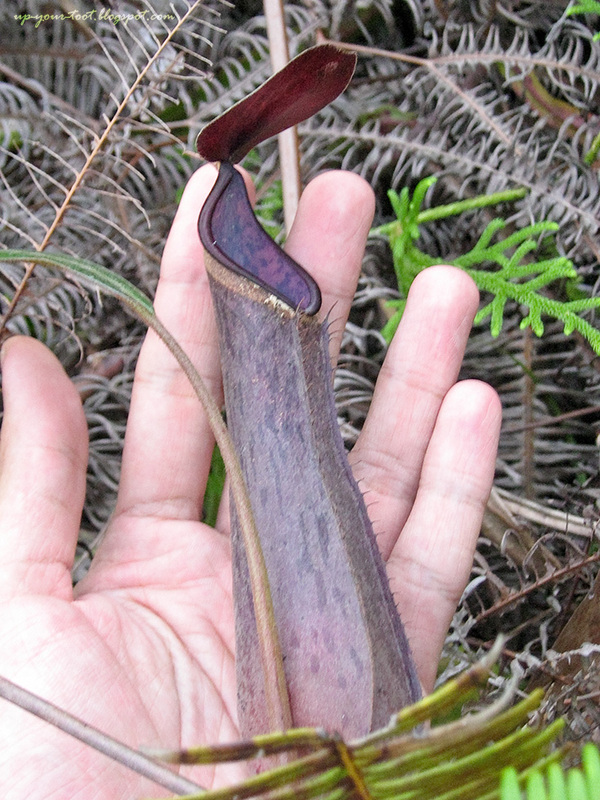 A lovely deep plum-purple pitcher of Nepenthes albomarginata at Penang Hill. All the pitcher of this plant are of this deep colour, whether old or new. Those that were withering had a more greenish base than the new ones. Tipping the pitcher over, I discovered the second thing about them, they are full of ants...dead, partly digested ants to be precise. Little did I know at that time that they prey specifically on termites, offering the white woolly band below the peristome that gives them the specific name albomarginata (white banded) as food in exchange for a few unfortunate members of the termites. The underside of the pitcher lid has interesting colouration as well. Most people fail to peek beneath the lid. Nepenthes are dioecious, that is they have separate male and female plants. 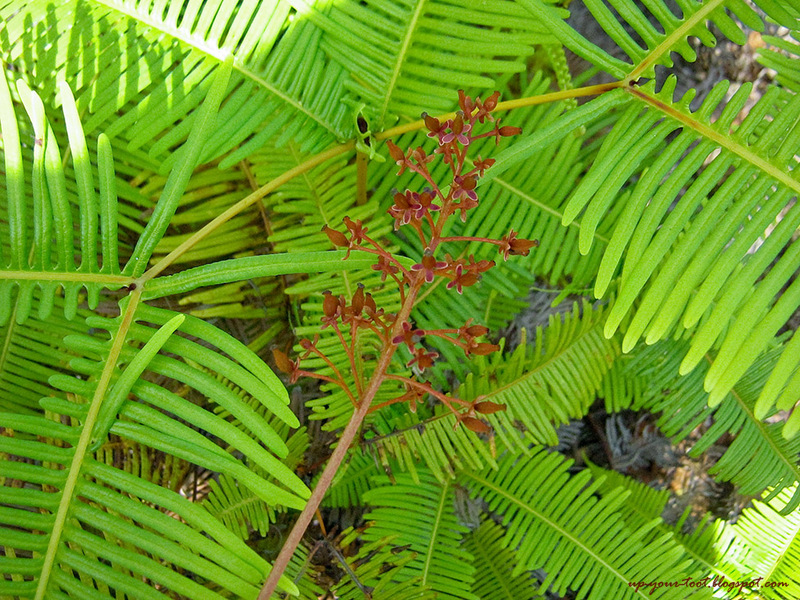 Male plants are more common than female plants in the wild. One tends to see more male plant clusters if one goes on a hike from the Penang Botanic Garden up to Penang Hill (this is the trail). Make sure you are reasonably fit, for you wouldn't want this to be your first and last hiking trip up Penang Hill. Female inflorescence of Nepenthes albomarginata. They dioecious meaning that they have separate male and female plants. Seed pods of Nepenthes albomarginata. Some of the pods have already split, dumping seeds that are long , thin and very lightweight. This feature enables the seeds to be carried by wind and surface water runoff to a new location. Nepenthes albomarginata are quite easy to propagate through cuttings once you know the technique, and I find that those grown from cuttings tend not to suffer from sudden root rot when compared to uprooted seedlings that had their tap root broken. The only drawback is that cuttings take a long time to get established, and the fine roots gets damaged if moved about too roughly when they are just starting out. They are also more suited to a drier medium, thus I use washed burnt-soil as the medium instead of the more popular growing medium for Nepenthes, i.e. Sphagnum moss. In the wild, the plants do suffer from some seasonal water stress (Dec-Feb), with leaves rolling up to prevent excessive moisture loss. One of the plum-red or 'Penang Red' types that I had. They are grown in burnt soil and covered with Leca gravel. The pitchers remain red, but the leaves turn back to being green in colour and not a plum purple. Also not that as the pitcher age, the red colouration is lost and the green base colour can be seen. From different 'Penang Red' plants that I have grown, I find that they loose the plum-red colour on their leaves when cultivated in the lowlands. The pitchers are also lighter in colour and have some green in them (at the base of the pitchers). Hence, the full redness of the 'Penang Red' variety might be temperature sensitive, and probably cool nights is what gives them the intense, shocking red colour. Another cultivated cutting of the plum-red type of N. albomarginata. 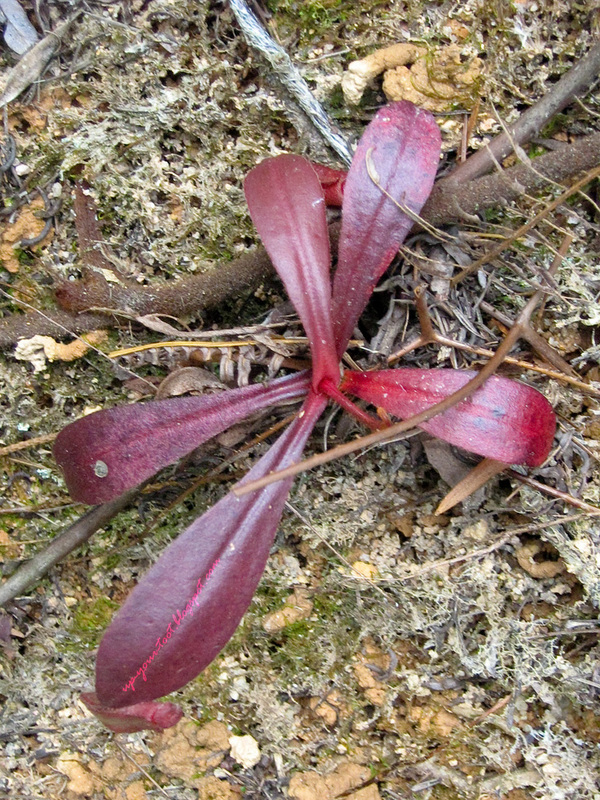 Note that the leaves have lost the total plum-red colouration and reverted to green with purple-red edges. Even so, the pitchers of the plum-red type have a more intense and concolor red than the green with red splotch type will ever have. The only type that I have not tried growing is the pure green variety, and even though I did take photographs of it, I didn't collect any cuttings from that plant as the plant was a female and in flower - we have got to give Mother Nature a chance. 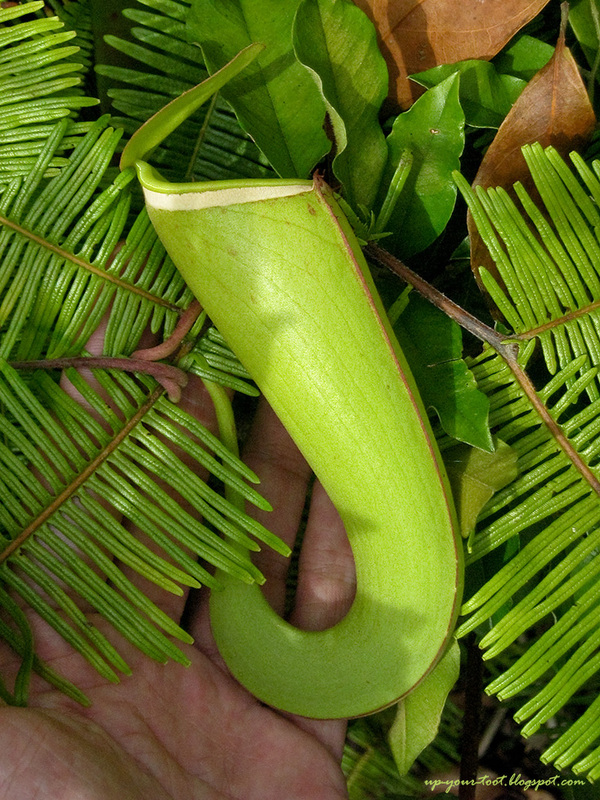 A nice infundibulate (funnel-shaped) upper pitcher of a green Nepenthes albomarginata. I didn't take a cutting from this plant as it was a female plant that was in flower. Most people would probably miss it walking by as the green colouration is similar to the ferns that surrounds it. 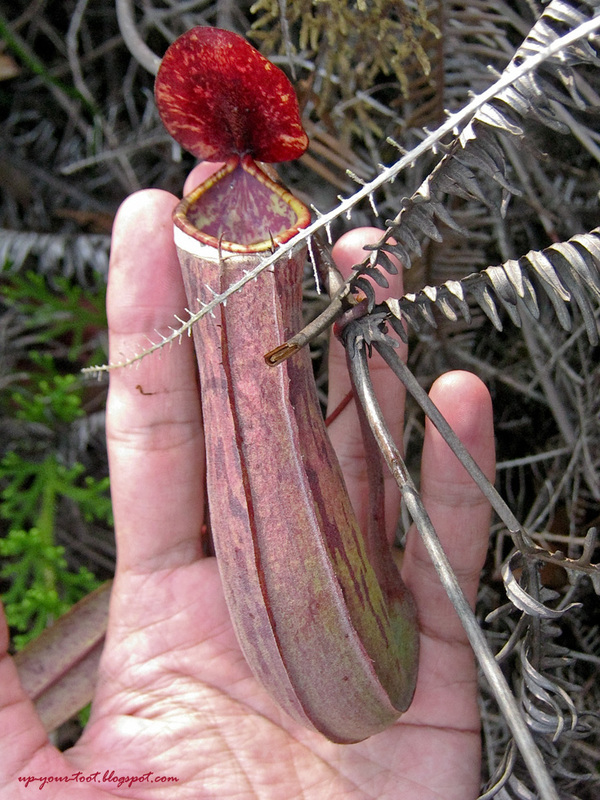 So the next time you go up to Penang Hill, keep an eye out for Nepenthes albomarginata, the white-banded pitcher plant. The pitchers may not be big, but they sure make up for it with their attractive and uniquely coloured pitchers. 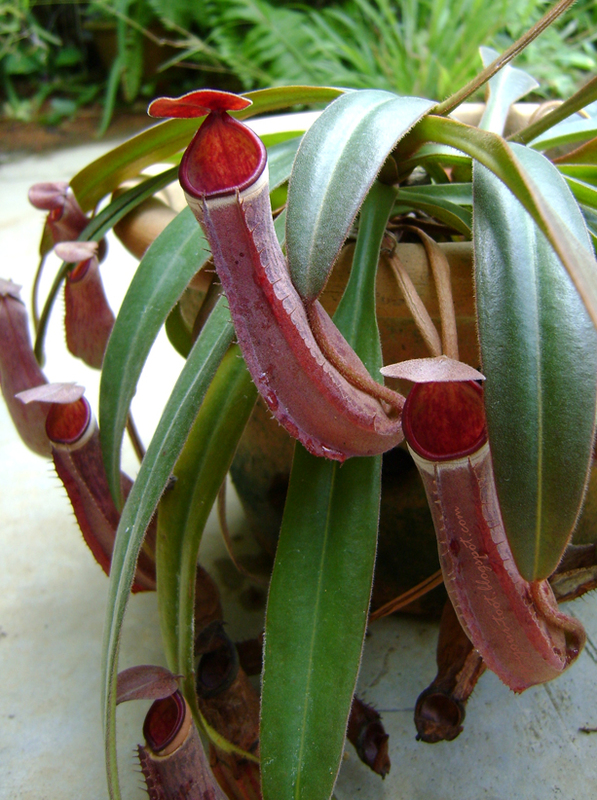 A lower pitcher of Nepenthes albomarginata. This is at my previous place in Kajang. The white fuzz on the leaves are the stellate hairs that cover the leaves and pitchers. If you are interested in buying Nepenthes or other carnivorous plants, you can try Fauzi's nursery (Nepenthes Garden) at Lembah Jaya Selatan, Ampang as he has a whole range of species and hybrids available). He orders plants from overseas as well and can post the plants. I learnt a lot about growing Nepenthes from him. Semak-samun? Those pitchers are really pretty! And your photographs as well. Thanks for sharing. Happy New Year Sean. Btw, send my regards to Fauzi when you see him ok. Thanks! Will send your regards to Fauzi. Ohhh they can grow climbing trees like orchids is it? Nampak cantik the one on the tree. They climb with the tendrils at the end of the leaves - the stalk of the pitcher will wrap around twigs and small branches. But this is only when they exit the rosette stage and start having elongated internodes. Bahaya bahaya I can easily see this can be an addictive as well. Start to imagine the pitchers climbing some of our plants here. Nanti I takut I smuggle some when I balik kampung my mother pergi masuk hutan. Hahaha, memang bahaya dan sangat addictive. The Indonesian and Bornean ones are much prettier - I buy them from Fauzi. The nursery is very 'dangerous' one. Once step in, sure get 'poisoned'. He has a stall in Subang Parade on weekends. Correction: Fauzi no longer sells at Subang Parade. He now concentrates on his home nursery in Ampang only.